On Friday in Times Square, the U.S. Department of Interior crushed one ton of ivory -- sending a clear message to traffickers of illegal ivory that the United States is committed to do its part to stop the slaughter of elephants across Africa. The trade responsible for the death of some 35,000 elephants annually (96 per day, or one every 15 minutes) also sows insecurity in countless communities impacted by the illegal ivory trade. 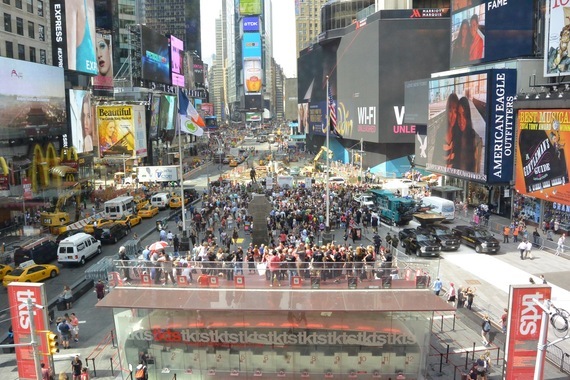 View looking south across New York City's Times Square on Friday, June 19, as approximately one ton of confiscated ivory was crushed. Photo by Julie Larsen Maher ©WCS. 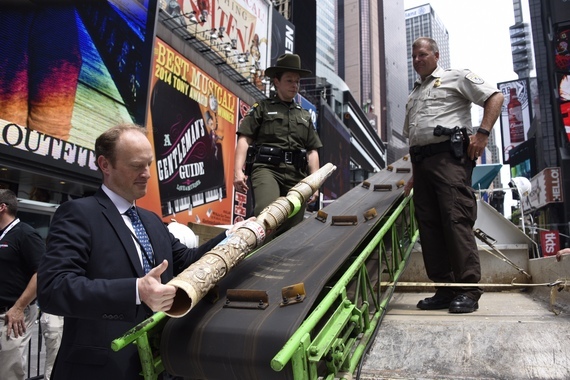 The Times Square ivory crush, representing the tusks of an estimated 60 poached elephants, came just two weeks after the May 29 destruction of a roughly equal amount of ivory in China, whose market is the largest in the world. On the day of their crush, China authorities signaled their intention to stop the processing and domestic sale of ivory. China noted that there are many other nations whose ivory markets fuel the elephant poaching crisis, calling on them to crack down further on their own domestic trade. With one of the largest markets outside of China, the United States must put an end to its domestic ivory market if it wishes to show leadership on this vital issue. WCS was proud to join Sally Jewell, U.S. Secretary, Department of the Interior; Dan Ashe, Director, U.S. Fish and Wildlife Service; several New York leaders; our NGO partners, African Wildlife Foundation; The Humane Society of the United States; International Fund for Animal Welfare; Natural Resources Defense Council; and the World Wildlife Fund. 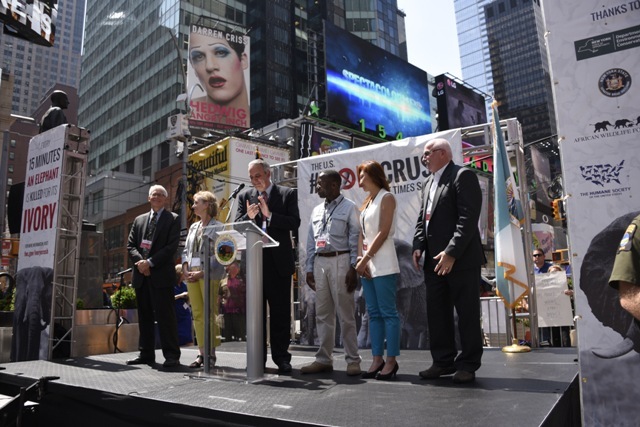 WCS Executive Vice President for Public Affairs John Calvelli, joined by representatives of partner NGOs, addresses the crowd at the Times Square ivory crush. Photo by Julie Larsen Maher ©WCS. Friday's symbolic action in Times Square did not occur in a vacuum. It is bolstered by policy efforts at the state and national level. Last summer, New York and New Jersey enacted bans on the sale of ivory within their states. And the Obama Administration has created a Presidential Task Force on Wildlife Trafficking, allocating additional funding to the effort while tasking agencies across the government to take actions to end this crisis. At the same time, close to a dozen nations have burned or crushed seized ivory stockpiles in the last three years, including Chad, Ethiopia, Gabon, Kenya, and the Republic of Congo in Africa, along with Belgium, China, Hong Kong SAR, France, the Philippines, and the United Arab Emirates. The world is truly uniting behind elephants. It is about time. WCS Vice President for Field Conservation Programs Joe Walston loads a piece of carved ivory on a conveyor belt to be crushed in Times Square on Friday, June 19. Photo by Julie Larsen Maher ©WCS. Much of the commentary around these destructions has been favorable, but some people have suggested that ridding ourselves of ivory might be harmful for elephant conservation by reducing the supply and thus stimulating prices (a key driver of elephant poaching). A recent misleading headline commenting on Malawi's destruction of ivory stockpiles (since postponed) read: "One of the Poorest Countries in the World Is About to Burn $7.6M Worth of Ivory." This misunderstanding is widespread, with some commentators erroneously suggesting that countries are foolish to burn such valuable national assets. Such criticism ignores two facts about confiscated ivory. First, because it is prohibited under the Convention on International Trade in Endangered Species of Wild Fauna and Flora (CITES) to sell seized ivory, it should not be compared to other confiscated consumer goods or to legal ivory from legitimate channels. Second, in assigning commercial value to poached and trafficked ivory, we may forget to calculate the social and ecological worth of living elephants for Africa. Approximately 35,000 elephants have been killed in Africa annually in recent years to feed the global demand for ivory. That is 96 elephants a day, or one every 15 minutes. Photo by Julie Larsen Maher ©WCS. The primary benefit in eliminating confiscated ivory is to prevent this material from re-entering the illegal trade and further stimulating trafficking, which has been a significant problem across Africa and Asia. If not destroyed, stockpiles must be secured in perpetuity. This is very expensive, logistically challenging, and often dangerous to those guarding them. Destroying this ivory sends a strong signal that governments will not tolerate trafficking and associated poaching. The awareness-raising value of stockpile destructions can be even more effective if the government destroying the ivory uses the occasion to announce new effective trafficking deterrents, including actions to fully prosecute criminals (particularly kingpins and major traffickers), significant fines, long jail sentences, and asset seizures. Closing ivory markets can address a significant threat to elephants and help African countries focus more on their in-site conservation. 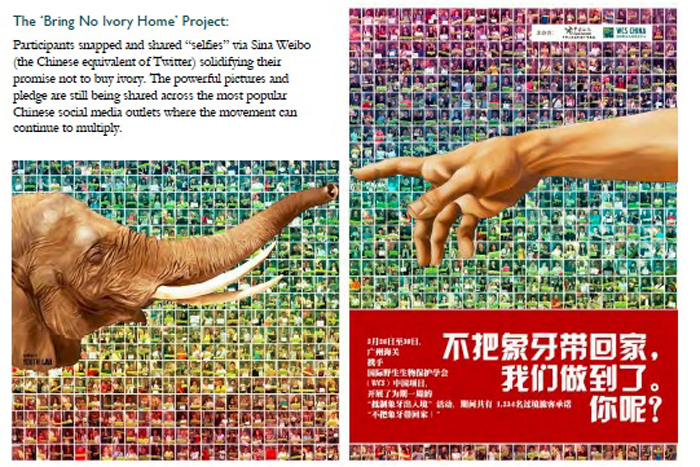 In the meantime, China's rich national carving heritage can continue using other substitute materials that do not support the trade in elephant ivory. Through a series of social media mini-campaigns developed in China, more than 8,000 Chinese have taken pictures documenting their pledge to "Bring No Ivory Home" on shouhudaxiang.org. Graphic ©WCS China Program. Consumers in the U.S., China, and other nations should join hands on this issue. As the Chinese government encourages greater ecological awareness among its citizens, the United States must itself do a better job in helping people see the connection between ivory sales and the slaughter of elephants. Supply side measures are essential but insufficient; elephants will never be safe until ivory is no longer perceived as prestigious or desirable. It is my great hope that yesterday's Times Square crush helps to elevate this issue for U.S. consumers, whose support and cooperation will be essential if we are to keep one of the world's great iconic species from going extinct in large parts of its range in our lifetime. Cristián Samper is president and CEO of WCS (Wildlife Conservation Society) and a member of the U.S. Advisory Council on Wildlife Trafficking. Follow Cristián on Twitter at: @CristianSamper.